Hello everybody, who walks by our little blog. I, Zane from akwiinas, would like to share one of my favorite tools for Etsy treasury curating - Shmetsy. You can find the first part of basics how to create a treasury at Elizabeth's post Here. What is this tool about you will ask. An answer is simple- it lets you add items to your treasury with one click and when it's published, you can send out convos to featured sellers with one click again! I believe it will save you a lot of time, I know it because it saves a lot of time for myself as well! Before we can enjoy the new treasury creating process, you can find the installation guide Here. Don't forget to read the user guide, sometimes you can find a lot of interesting information there. When the installation process is finished you may need to restart your browser. After the restart you will find a little icon on right side bar. Preparations for the big Treasury creating is done. 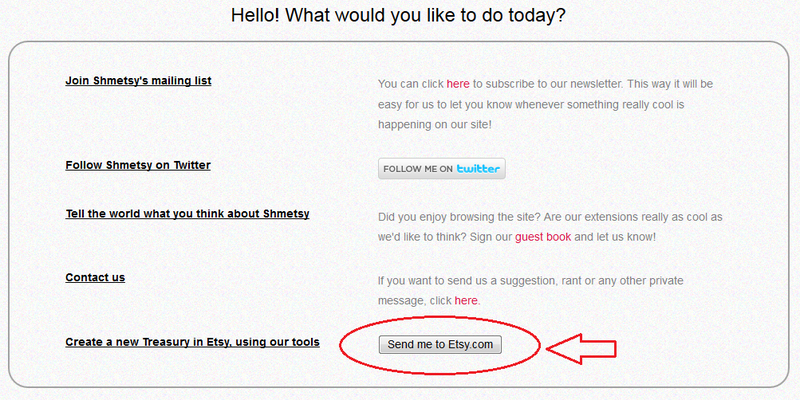 Click on the Shmetsy icon, choose "Treasury Maker" and in a new tab you need to click on "Send me to Etsy.com". The treasury creating page which will open has the same look as regular Treasury creating page. Magic happens when you search for items to feature in your treasury (search for items in a new tab via search). Next to each items price you will find tiny smiley face. when you click on it and it turns to green, filled face, it means you have added it to your treasury in another tab. Add 24 items to your treasury, fill the title and the description fields and tag it to make it easier to find for others. 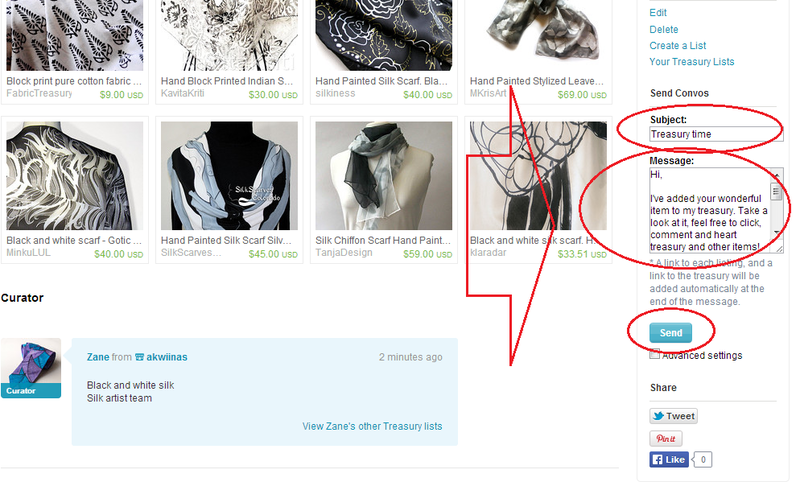 Just like now with all the treasuries created in Etsy you can save it as a draft for yourself or publish it. Within a few minutes you can create a treasury with the most beautiful items. Isn't it easy? 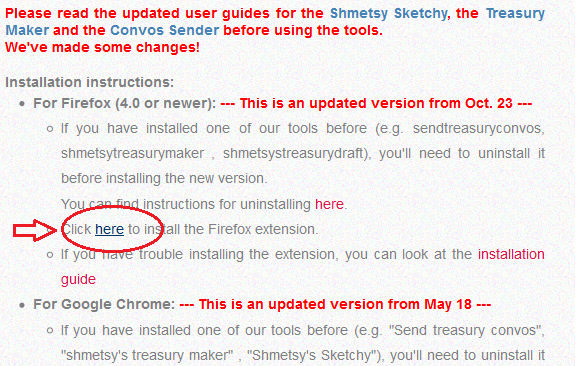 One more great extra from Shmetsy is the convo sending after you have published a treasury. 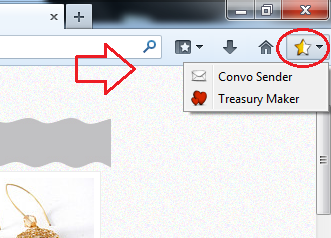 To do that you need to open a created treasury and click on the Shmetsy icon. This time choose "Convo sender" and check if it offers you to notify featured artists from the right treasury. Scroll down a little bit and on the right sidebar, below Curator tools you will find "Send Convos" section. Type in the Subject and the message, one click on the Send button and it's done! 24 convos are sent! If you click on the Advanced settings you will be able to check boxes to include listing name of the featured item in the convo's subject and to include a listing url to the message. I hope you will find Shmetsy helpful for your daily treasury creating process! Feel free to share your treasuries created with this tool! Wow, very interesting and helpful. I didn't know there was something so nifty. Thanks. Wow! this is such a thorough tutorial! :D :D Gotta give it a whirl! :) Thank you! Will check out Shmetsy!